Misty Lucas joined MAA in the summer of 2017 as Executive Director of Illinois. She is excited about working within this amazing agency to assist families as they take a journey through adoptions to complete their families. Misty completed her bachelors of Social Work in 1993. She completed her masters in Mental Health Counseling in 2013. 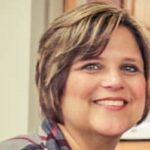 She has worked within the social service field for many years within various roles at Baptist Children’s Home, private practice, and Spero Counseling and Wellness Center. Misty has studied and worked with children and adults who have experienced trauma. Her focus has been on identifying and teaching nurturing dynamics within the family. Misty enjoys antiquing, spending time with her family, volunteering through her church, and working with younger children. She and her husband of 23 years have three smart and fun children, Jase (20), Brooks (19), and Austyn Kate (15).